Taking Bonobos public was top of mind for Andy Dunn and his board earlier this year when he had a chance, and revealing, phone conversation on a plane with a friend from Jet.com. It was then, Dunn admitted that he was looking for another round of funding. The friend said, "Why not come with us?" "Jet?" asked Dunn, the founder and CEO of Bonobos. On Friday, June 16, several months later, Dunn's Bonobos is set to become part of Walmart (WMT - Get Report) , which owns of Jet.com, for $310 million in cash. As part of the deal, Dunn's new position is to oversee Walmart's digitally native vertical brands, including ModCloth, which sells women's clothing. Walmart's shares fell 5.5% to $74.59 on Monday morning. Dunn and Marc Lore, president CEO of Walmart e-commerce, talked with TheStreet on Friday about the deal and what it means for them, the companies, customers and brands. The following interview has been edited for length and context. Editors' pick: Originally published June 16. Q: How did this negotiation play out? Dunn: It was a sliding glass moment. If I hadn't had the conversation on the plane, I wouldn't be talking with you now about the deal we announced today. Lore: From our first meeting, I knew this is something we wanted to do. I admired what Andy had done, building a successful e-commerce site. He is a pioneer in the space. Q: Bonobos is an independent brand, which certainly appeals to your customer base. What are your thoughts selling to the world's largest retailer? 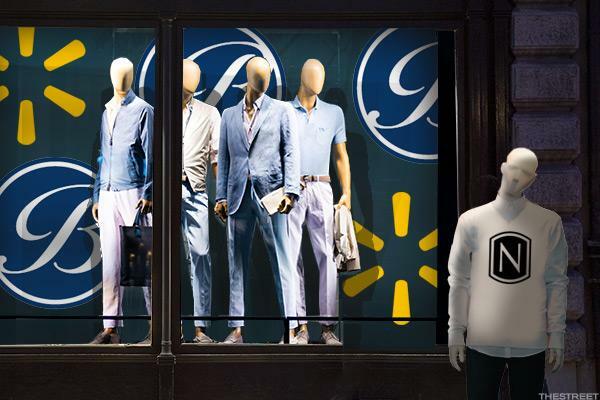 Dunn: People are concerned about affiliation, but Bonobos clothes won't be sold at Walmart stores. For me, my connection to Bonobos, which I characterize as a nerdy menswear site, is a psychological one as well as a business one. When you spend 10 years building something like Bonobos, it's like a birth in a sense. Having said that, we are proud to be owned by Walmart. As a Midwestern kid, growing up I went to Walmart every week with my mom to get pictures developed. I'm excited now that Walmart will be shepherding the next stage of the business. Q: What changes will customers notice? Dunn: Bonobos will get bigger and faster at shipping. Q: How does the acquisition fit into the overall plans of Walmart? Lore. We have been doing a lot of organic growth, with two-day shipping and Easy Reorder, which is like playing catch-up. Our recent acquisitions, including Bonobos, is playing offense. We will be connecting to the millennial shopper and that is an attractive e-commerce model that gives us higher margins.